This entry was posted in Uncategorized and tagged airline, airplane, airways, aviation, flight, international, report, TG, thai, trip by christao408. Bookmark the permalink. 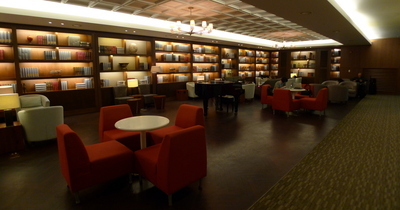 What I noticed first was the cleanliness, color and brightness of the airports and lounges there compared to here. I have only flown out of Seatac and also on Army Hops when civilians-or wives were allowed to catch a hop from Fort Lewis or Madigan bases.Your flight looked so comfortable and the food looked yummy.I enjoyed taking the flight with you and Tawn through your video. Wow, I am totally impressed by the airlines. I have not flow for a time but it sure beats the airlines I have used here. Oh, interesting how Tawn appears in many photos . Kidding. that is a long trip and too bad it’s not nonstop anymore. You are a good story teller with your photos. 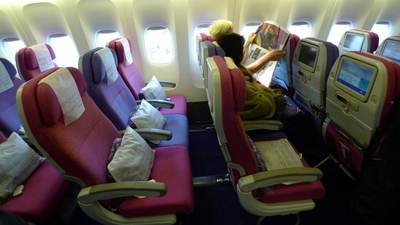 Many years ago I went on Thai Airlines from HongKong to Bangkok. At that time I thought the food was exceptionally good. But that was MANY moons ago. I love the pictures you have posted here Chris. What a great blog. I feel like I just took the trip with you! Thanks for sharing! Welcome to LA. I took EVA both times to BKK, they stop over in Taipei of course. Last time, 8 years ago the new airport wasn’t open yet. EVA has a class between coach and business called Deluxe. Much more room for my long legs, it was worth the extra cost for a long trip. love all the food pictures and airport commentary =) this is getting me excited for my trip to AMS and BCN next week! i really enjoyed the video chris! the quality is grade A, thanks for taking the time to create and share this with us! i really enjoyed this post i felt like i was taking the trip with you. i liked the sculpture what is the story of the milk ocean? the scandinadians have a mythology of a milk ocean. in the biginning there was a cow and from its four teats flowed the four milk rivers the ice was in the north and the fire was in the south and when the fire melted the ice there was the first man and woman . how does the hindu story go? oh,that’s good.my brother hasn’t been over there lately but I saw ya’all on House Hunter’s International at Pappaya Beach. I always enjoy your videos. One of these days, I hope you get Gary or Jason in there. As for the photos, I’m not sure why they are a lower resolution. Maybe when it gets uploaded, Xanga does something to them? @ElusiveWords – It seems to be a change form the norm. I uploaded the photos for previous entries and they look pretty crisp, but more recent uploads do not. Maybe the browser from which I upload? @kyle061685 – Thanks for stopping by and commenting. From an entertainment perspective, air travel is getting better. Although if you are flying United’s 747s in economy, you are still subjected to the “main screen” at the front of the cabin for a shared viewing experience! Still, non-US carriers seem to remember that it is a customer service industry. US carriers have lowered the bar again and again. @Texasjillcarmel – House Hunter International? @grannykaren – Fascinating! I didn’t know that story. As for the Hindu myth, you can find a nice summary of it here. @nov_way – Thank you, thank you. @l0311879l – So nice of you to say; glad you enjoyed it. 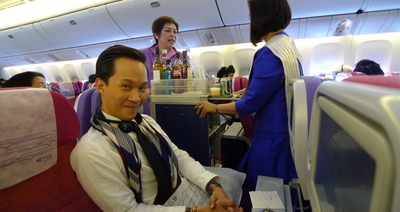 @lil_squirrel4ever – I trust you will be sharing your travel experiences with us, right? 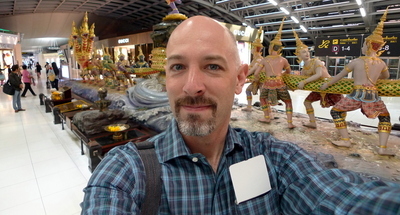 @CurryPuffy – It is kind of tough because if they don’t have that schedule, they arrive into LAX at a time that doesn’t allow onward connections. 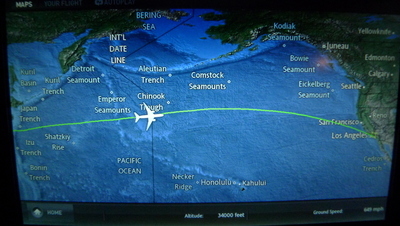 That was the problem with the nonstop flight: it arrived at 8:00 pm leaving only a connection to SFO as an option. Now, with a 10:30 am arrival, you can continue on to anywhere else in North America and arrive before bedtime. 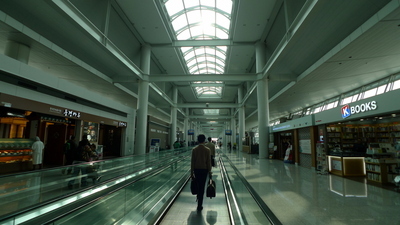 soon i’ll get to know incheon airport as i’ll be in seoul by the end of this month. looking forward to the trip. 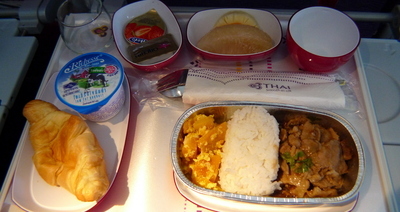 that pork green curry tawn had looks delish. 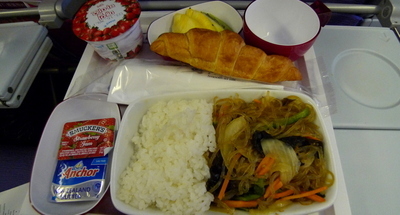 i doubt i’ll get that on Garuda Air, perhaps a different type of curry maybe, but certainly NO pork.